Catch up with all the latest news from our school. To celebrate World Book Day and International Women's Day, we are holding a coffee morning for all parents/guardians this Friday 8th March from 9:30 - 10:45 am in the main atrium. Feel free to bring along any of your favourite female authors, or just even to share stories about inspirational women in your life! Looking forward to seeing you all there! This term we launched Bremore ETSS new online newsletter. We hope you enjoy our new format which includes stories and articles from students, teachers and parents. We decided to move away from the printed format to save money and also be more environmentally friendly. We are always looking for new writers and stories. Please contact Saadia for more information. You will find a link to the Newsletter below. Note: Click on Plus Icon ( + ) to add payment amount. Paying by text: you will be asked a security question before seeing your bills. This will allow you to Login at any time and view all activities and bills from your child’s school. In your Way2Pay dashboard you can see all activities for all your childrens including payment history and up-coming bills. You can store your card details, pay by instalments, up-load credit and make financial plans. Simply go to Way2Pay.org, enter your phone number and click to receive a new link to pay any outstanding bills. Way2Pay offers support directly to parents so if you are having any difficulty using any of the options above please get in touch directly with their help desk on 061-203355 during office hours or email support@way2pay.ie. We thank you for using Way2Pay and help our school in our aim to go cashless. We are almost at the half-way point of our first term and what a busy time it has been! We finally made the move into our new building and all of the staff have been extremely busy getting us settled in. It has not been an easy move and ideally, we would have had the summer to set up the school but it was not to be. We still have a long way to go but I am very pleased that we recently took possession of the PE Hall and we are hopeful that we will receive the other areas in the near future. I would like to take this opportunity to thank all of our students, staff and you, the parents for your support during the move. The phone lines are now up and running using the Internet as we are still waiting on Eir to install cables to the school. We hope there will be no more issues with communication. Our Homework/Study Club begins after the midterm break. It will run two days per week (Monday and Tuesday) from 3:45 -4:45pm. Students must sign up and it is offered on a first-come first-served basis. Places are limited so students who are interested should sign up through their tutors. There are many extra-curricular clubs up and running in the school. The range of activities on offer is fantastic and this is a testament to our staff and the commitment they have to the students in the school. I would like to remind parents/guardians that it is the responsibility of students to inform their parents if they are staying late for clubs, training etc. It is not possible for us to allow students to ring home each day. Thank you to the Parents Council for hosting the recent coffee morning. We will be in touch in the near future about our AGM and we are always looking for new parents to get involved. It is really important that we have strong parental involvement as the school grows and develops. Good attendance and punctuality are important life skills for us to instil in our students. The school opens at 8:15 am each morning and students should be in school no later than 8:25am in order for them to use their locker and be in tutorial for 8:30am. Students who arrive late twice in a week or three times in a month, will be asked to attend an after-school learning opportunity every Thursday from 3:35-4:05 pm. We all have occasional days whereby we are late; however, we hope our Punctuality Drive will encourage students to be on time each day. We recently had two Department of Education inspectors visit the school for a subject inspection. They found the teaching and learning standard to be of a very high quality and they noted the exemplary behaviour of our students. We are really proud of the standard of education that we are achieving in Bremore ETSS. Our staff are fully committed to innovative and effective practice and it is very affirmative to have this recognised by the Inspectorate. All students should bring a healthy and nutritious lunch with them each day. This will help sustain them through their busy day and support their learning. Every Monday and Tuesday, we have a tuck shop open and students can buy rolls, salads etc. We hope to have a fully operational canteen following a tender process. We look forward to welcoming our third-year students and parents this Wednesday evening for an Information session from 6:30-7:30 pm. The third-year students are our first cohort to participate in State Examinations and we wish them every success in their studies this year. The evening will focus on information about examinations, study skills, student wellbeing, Transition Year etc. so please try your best to attend. All teachers are engaged in ongoing assessment of students learning. Indeed, here at Bremore ETSS, we also encourage students to be engaged in self and peer assessment to support them to recognise and take responsibility for their own progress. Formal Winter Assessment weeks take place for each year group. During this time, students will participate in classroom tests. The results of these will be shared with students and parents through a written report, which will be posted home. The reports will also be shared on VS Ware. Each year group also has one parent-teacher meeting per year and students are encouraged to attend with their parents/guardians. If you have any concerns about your child’s progress, please do not hesitate to contact the school to discuss this with the relevant subject teacher, Tutor or Clann Leader. All first-year students are currently in the process of sampling their subject options. It is important that all parents have logged into VS Ware using the login details provided to you. Towards the end of November, your son/daughter will be invited to choose their options in order of preference and this must be completed through your VS Ware account. Bremore ETSS are delighted to have been chosen to be part of the Heritage Language Initiative run by the Department of Education. We have been allocated a Lithuanian Language teacher, Jurgita, and students have the option to attend Lithuanian Language classes every Tuesday after school. As an Educate Together school, we are delighted that heritage languages are being formally recognised and promoted. We would love if the Language Initiative could be offered to other students in the future. This Tuesday, we welcome the Lithuanian Ambassador in Ireland to Bremore ETSS. All families with Lithuanian Heritage are invited to the launch of the Initiative and we look forward to meeting with you and celebrating your culture! All second-year students and their parents/guardians are invited to a Junior Cycle Information Evening on Thursday 8th November at 7pm. This session will outline the significant changes to the Junior Cycle and key dates for Classroom Based Assessments which take place throughout the year, and form part of the new Junior Cycle Profile of Achievement. Looking forward to seeing you all there. Our school promotes a Restorative Practice Approach towards managing conflict. When difficult situations arise, we endeavour to use these as learning opportunities and to develop relationships and skills amongst our students. Good discipline supports learning and a safe environment is essential. In recent weeks, there have been some external situations happening which have had potential to affect our school environment. We ask all parents to support the school by talking to their children about their behaviour outside of school and in the local community. Whilst we cannot be responsible for behaviour which happens outside of the school, we do aim to support conflict resolution and work with those involved. All members of our school community, whatever their social, cultural, belief or background, are expected to work together in an atmosphere of dignity and respect. We are thrilled to have been recognised for our democratic practice in Bremore ETSS. The Council of Europe Education Department have invited one staff representative from Bremore ETSS to present at the conference ‘Democratic Schools for All’ in Oslo this November. The recognition comes from our whole-school approach to being democratic in our practice. Keep an eye on our Twitter page for more news on this! The following committees are now back up and running in the school, Student Council, Relationship Keepers, Green Schools, Amber Flag, LGBTI+, Development Education. These student-led committees provide an opportunity for listening to our student’s voice and to include them in the development of the school. All students are invited to express themselves through fancy dress next Friday 26th October as we finish up for the Mid-Term break. This invitation is not exclusively for Halloween fancy dress. An Awards Assembly for students will also take place, recognising the achievement and hard work of our fantastic student cohort. Wishing you all a very happy and safe midterm break. There will be a chance to explore the new school, meet the staff and students and find out about the Educate Together ethos at Second Level. Parents/Guardians and students in 5th and 6th class are welcome to attend. We have had a very busy and successful few months here in Bremore E.T.S.S. All of our staff, students and parents are working hard to support the continued growth and development of the school. Here are just some of the things that have been happening over the past number of months…. Bremore E.T.S.S., along with three other partner schools have been granted the Digital School of Excellence Fund. This entails us working collaboratively on an innovative project in teaching and learning that uses digital technologies. The focus of our project is ‘Assessment in Junior Cycle’. This exciting project allows us to continue the work we have begun with Trinity College and Bridge 21. Our Amber Flag Committee held a very successful whole school ‘Sunrise Walk’ recognising and acknowledging the importance of minding our mental health. We are proud to say that this event, alongside the work they have carried out through the year has earned us our Amber Flag! Staff and students will attend a ceremony in Cork next week to receive our flag. We look forward to raising this together next year. Centre for Talented Youth Ireland (C.T.Y.I. ), D.C.U. We are delighted to have secured four more student scholarships in the C.T.Y.I. Programme this year. We are very proud of our students’ achievement in this area and we are sure they will enjoy this opportunity. Our work in this area is progressing very well. Our staff have been collaborating with other Educate Together schools and this week we will display our work at a showcase event in Hansfield E.T.S.S. All of our first year students also visited Sonairte Centre and our Business Studies students held a Fair Trade food market. Our Green Schools Committee have also been working hard …They recently received an award for participation in the An Taisce ‘Neat Streets’ programme and we are well on our way to achieving our Green Flag. Before the Winter break, all students participated in a Phenomenon Based Learning (P.B.L.) event in the area of ‘Climate Change’. Before the summer holidays, we will explore a Philosophy themed P.B.L. This innovative practice allows students to engage in enquiry based learning at their own pace and offers them opportunities to think critically and engage in topics in a meaningful way. Before Spring break, all students participated in a very successful reading initiative ‘Drop Everything and Read’. Thanks to those families who donated books to our book drive, we have created class libraries for all classes in the school and we would hope to increase these in the future. Students also participated in several other literacy themed initiatives which aimed to raise the profile of reading in our school. These include a weekly Book Club, World Book Day Fancy Dress and Literary pairs competition. Thanks to all those involved. Thanks to our P.E. teacher Mike for organising an excellent Active Schools Week which culminated in our whole-school trip to Clogherhead Adventure Centre. We are proud that being active is such an integral part of the student experience in Bremore E.T.S.S. Our Parents Council are working tirelessly to support and enhance the work we do in the school. I would like to take this opportunity to thank them for their commitment and dedication to the school. Every parent/guardian of a child in the school is automatically a member of our Parents Association and we need your support to work together in partnership to develop our school. Please get involved in any way that you can. Our Sports Day is scheduled to take place on Monday 28th May, weather permitting. More information to follow but please keep this date in your diary as we will invite our families to a whole-school barbeque that afternoon. Our Parents Council will also be looking for volunteers to help organise this. Formal Summer Examinations will take place from Monday 21st – Thursday 24th May. Students will receive an exam timetable so please note alternative finish times on these days. Please ensure that students are well prepared with all equipment needed for each exam. Formal reports will be sent home to all students by the end of the year. The whole-school will visit the Planetarium in Armagh on Monday 14th May. These co-curricular activities really support student learning and offer them excellent opportunities for experiential learning. Our first cohort of students in 2nd year are currently engaged in C.B.A.’s which will form part of their Junior Cycle Profile of Achievement. As we have developed a policy of having C.B.A.’s in all subject areas, our students are well prepared for this form of assessment. We wish them all the best and look forward to seeing their results. Thank you to all who attended our ‘P.M.I.’ on the attendance policy. It is important that the voices of all educational partners are included as we develop policies in the school. The Policy is now available on our website. Please note that the policy states that students will not be permitted to leave school for any reason without being collected by a parent/guardian. All absences must be explained in writing. You may use the journal to communicate with the class tutor. All students have been given re-enrolment forms for the 2018-19 Academic Year. Completed forms and school fees must be returned by Friday 25th of May. Equipment lists and School Calendar for 2018-2019 will be posted during the summer. Our end of year Awards Ceremony will take place on Wednesday 30th May at 1:45 pm. As always, we invite families to join us in recognising and celebrating student achievement. Our new school building is progressing well and the most recent date we have been given for moving is mid-June. To facilitate the move and packing up of our temporary accommodation, school term will end for all students on Wednesday 30th May. We look forward to showing you around the new school building in August. I would like to take the opportunity to sincerely thank all the staff and students for a hugely successful year. Looking forward to continuing our journey in our new building next year. In accordance with Circular 0081/2017 issued by the Department of Education and Skills, all schools are permitted two half-day school closures in order for staff to upskill in the important area of Child Protection. The release of the Children First Bill 2017, Child Protection Procedures and Child Safeguarding Statement give new mandated responsibilities to all teachers and it is essential that staff receive adequate training in these areas. As such, we will close at 11:55am on both Tuesday 8th of May and Wednesday 9th of May to allow for this training to take place. There will be no after-school activities on these days and all students must leave the building at 11:55 am. Staff and students were invited to dress up as famous literary characters. There was great excitement first thing in the morning as staff and students tried to guess who everyone was supposed to be. Students were greeted by The Mad Hatter, Little Red Riding Hood, The Queen Of Hearts and Wally as they entered the school, setting the tone for a literary day where they would be taught English by Superman and The Cat in the Hat, French by Triss from the Divergent series and Irish by Harry Potter. Prizes were awarded to the three best costumed students with first place for an excellent Katniss Everdeen complete with bow and arrow. The event created good conversations about the books chosen by staff and students to represent and the bar has been set high for next year. This involved staff each wearing a badge with the name of a famous literary character. Students then had to match pairs of characters from famous books. Think George and Lennie from Of Mice and Men, Jane Eyre and Rochester from Jane Eyre and Katniss and Peeta from The Hunger Games. There was a fantastic buzz around the school as students searched the entire building trying to find all of the literary pairs. First prize was won by Break-Time by an enterprising student who deducted that our principal Kathy was Sherlock Holmes. As an English teacher, the highlight of my day was a student pulling Of Mice and Men out of the book box during DEAR (Drop everything and read) Time, asking me was I Lennie from this book, and deciding to read the book. The Amber Flag Committee was set up in September and have been working tirelessly to come up with a positive, community spirited event that focused on the issue at hand, teenager wellbeing and from that the Sunrise Walk was suggested. As promoting positive mental health and Wellbeing are at the forefront of not only society needs but also curriculum demands of the new Junior Certificate, this school thought there was no better group of students up to the challenge. 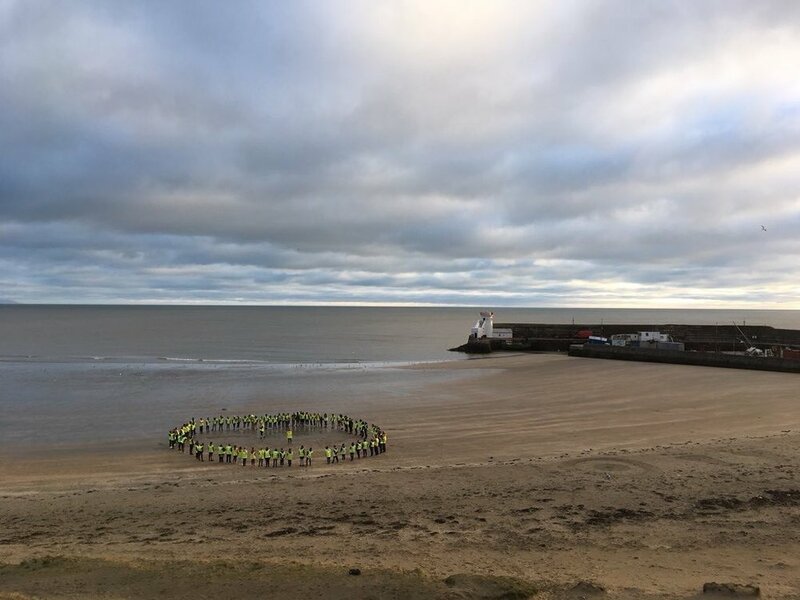 On Friday morning a large group of students, parents and staff met at 6am and walked from the school to Balbriggan beach arriving for sunrise. Here they gathered and remembered the reasons behind this campaign. The group then walked back to the school for a well deserved breakfast for students, parents and staff. The community breakfast was kindly sponsored by local businesses Borza (Traditional Fish and Chips) and Supervalu Balbriggan. As a new school, with such a small community at the minute, it is a real pleasure to be able to initiate this close knit community with parents and local people at this stage setting the precedent for when we grow and move into our permanent premises soon. All students also had the chance to meet and chat with representatives from Samaritans - the committee’s chosen charity for this fundraising event. 1. To raise awareness of and promote literacy in the school. 2. To promote reading for pleasure. Friday 26th January – Book Drive. We are asking for donations of suitable books for teens to support the creation of our ‘class libraries’. Each student who donates a book will be awarded VS Ware points. Monday 19th February – Friday 23rd March - DEAR Time Initiative (Drop Everything and Read). We will dedicate 15 minutes of each day to Reading for Pleasure for a five week period. Students will keep track of their progress on a class wallchart. We will use the materials from the Book Drive and our own collection of books to ensure each student follows our ‘book in the bag’ policy. As part of our extra-curricular programme, we will soon be launching a weekly Book Club. More details will be shared with the students as to exact times etc. in the coming days. The chosen book is ‘Spirit of the Titanic’ and we have already secured a visit from the author, Nicole Pierce in the near future. We also hope to have several more exciting activities surrounding World Book Day whereby we hope to raise the profile of literacy in the school. In addition to this, please find attached a recommended Reading List for your child. We would also encourage your child to join the local library and make reading part of their everyday habit. Research shows that teenagers who regularly read have a broader vocabulary and improved writing skills. It can also improve their critical thinking skills amongst a range of other benefits. If you have any queries/concerns regarding our Literacy plan, please do not hesitate to contact us. *Please note that these lists are guidelines only and have been taken from the JCT website. As we approach our second Winter Holidays as a new school we would like to take this opportunity to say how much we enjoy working in partnership with the students, staff and parents/guardians. We are making excellent progress in the development of the school thanks to this team effort. We would like to take this opportunity to thank you for your continued support. Please see announcements below for your information. This Insurance is optional, however if your wish to avail of one of these options, please return to your child’s tutor, the completed form with the exact amount only in an envelope with your child’s name and class by Monday 11th of December. In an attempt to promote reading, the school Literacy Team are in the process of creating Class Libraries for each group in the school. If any families have books that would be suitable reading for 1st or 2nd year students and wish to donate them, we would greatly appreciate it. Book boxes will be left in the main hall and students can drop books in each morning. The week beginning the 18th of December, all of our students will be working on a Phenomenon Based Learning (PBL) project. This is an innovative and exciting approach to learning that our staff have been planning with the Bridge 21 Team in Trinity College Dublin. Parents/Guardians will be invited into a display of the PBL work and to our Winter Awards Ceremony during that week. More details to follow. At present all Clann leaders are arranging visits to universities for all class groups. We hope that these experiences will motivate your child to think about their future choices. Please check and sign your child’s homework journal on a weekly basis. All teachers assign regular homework and students should record all their homework in the journal, even if it is uploaded to One Note. All students must bring lunch with them every day to school. Please remember that there are no facilities to purchase food in the school. As we are currently experiencing very cold weather we would like to remind you that every student should wear a jacket/coat to school. Please also make sure that students who cycle to school wear a safety helmet. A reminder that school begins each morning at 8.30am. Supervision on the school premises begins at 8.20am. Please ensure your child arrives on time each morning to school to prevent disruption to class. The architects have been in touch with a building completion date of end April/ early May 2018. This is great news and we will keep you informed of any further developments as we have them. Please note that school will be closed for the full day on Thursday 30th of November to facilitate further Junior Cycle Training. 2nd Year Parent Teacher Meetings will now take place on Wednesday 29th of November from 4.15pm – 6.45pm. The Parents Council would like to invite all parents and guardians to a coffee morning in the school at 11.10am on Wednesday 15th of November. All are welcome to attend. The Parents Council AGM will take place in the school at 7pm on Wednesday 22nd of November. All parents and guardians are encouraged to attend. I would like to welcome all our pupils and families back from their summer holidays and wish everyone an enjoyable and successful school year for 2017/2018. Welcome to all of our new families joining the school, we hope to get to know you all over the course of the year. Parents are welcome to take part in the many events run in the school each year by the teachers and parent’s council. We have an active parent’s council and we would encourage you to get involved or attend some of the activities organised. Last year our parents worked with us to help develop our Positive Behaviour Policy; we will have more opportunity for this type of activity this year. Getting involved will allow us to build good relationships and enable us to work as a team as your child progresses through the school. Talking to other parents may provide you with some support as your child becomes a teenager. Being involved in your child’s school life shows them that you are invested in their education. Starting from Monday, September 4th, for all pupils, the school will be providing supervision from 8.20am. Students should not arrive any earlier to school. Students must arrive on time; late arrival will be managed using our Code of Positive Behaviour. Parents support is appreciated. Please familiarise yourself with the school dress code, it can be found on the school website www.bremoreetss.com . Please note some students are wearing flip flops/sliders to school, they are not suitable for PE class or activities that may happen throughout the day, for health and safety reasons, and therefore they should not be worn to school. 1. Calling to the school. If during class times, you have a message for a pupil or wish to contact the teacher, please call firstly to the secretary’s office. Please do not call your child on their phone as they are not allowed to use mobile phones during class times. 2. If your child rings you from their mobile during the school day. Please remind them not to use their personal phone to call home, if they ask in the office they will be allowed to call home. If they have an issue or problem please encourage them to seek assistance from any staff member or in the office. 3. Forgotten Equipment and Lunches. Now that your child is in Secondary School we are trying to encourage them to become more independent, therefore if they leave lunch or equipment at home, they should not ask their parents to bring the items to the school. 4. Absent notes/Letters to the teacher. There is a section in the school diary for parents to write notes. You child’s Tutor is the first port of call. 5. Text Alerts. The school uses a texting system to alert parents of various activities, if you change phone number or any other contact details, please ensure that your contact details are updated in the office as soon as possible. The school carpark is for staff cars only, parents can drop off and collect students. Please note there is a one-way system in place, please drive in the second gate. Please drive slowly. Until we have a canteen in place in our new building, all students are asked to bring in a healthy lunch. Students will be awarded VSware points if the staff see them eating healthy nutritious food. Fizzy drinks are not allowed. Unfortunately the delivery of 1st Year lockers has been delayed by 12 weeks. This is disappointing but is unavoidable. We hope by the time we have moved into the new building, the lockers will be installed. We will keep you informed on any developments. From next week, all students will have homework/home learning. Homework will be recorded in the student’s diary. Parents should sign the diary each night when the homework is completed. To help your child meet the homework deadlines you might put a calendar up in the house and ask them to mark in when Homework is due. Some children may need more help than others with organisation skills. Parents support is appreciated. School trips are part of the curriculum, students must attend all trips organised. Permission slips will be sent out for all school trips; students must get them signed by a parent and return it to school. If they do not have a permission slip, they will have to remain in the school and work will be set for them. This is to be discouraged, as supervision would need to be provided. Parents support in this matter is appreciated. This year we are focusing on the Junior Cycle Key Skills. Key skills help learners develop the knowledge, skills and attitudes to face the many challenges in today’s world. They also support students in learning how to learn and to take responsibility for their own learning. Parents should familiarise themselves with the language of key skills as you will hear your child using this language throught the year. We have recently been informed that our school will be awarded a diplomatic passport for our work in Development Education on 27th of April. One teacher and four students are invited to attend the event. During the year our teachers attended the Ethical Conference with our students who presented their Shadow Puppetry Project with a Gender Equality Theme. All of our students are involved in Development Educational activities, which run through all of our subjects. The students keep reflective Journals on their lessons and DE activities. We are very fortunate to have an experienced a Parent who is a professional researcher in the area of development education on our Board of Management. He attended some of the meetings with our teachers and World Wise. Our students have just participated in a two day session of Phenomenon Based Learning. This involved students engaging with the Phenomenon of ‘Energy’. This involved us ‘dropping the timetable’ and allowing students to choose their own Research Question based on the Phenomenon and then create a product to show their learning. It really was a success. We are looking forward tomany more events like these! We were delighted to work with Trinity College and Bridge21 this year, they held many workshops for our students and teachers. So far we have looked at planning and development of the school, Phenomenon based learning, Collaboration and lesson planning We are now working on assessment practices and procedures alongside the other new Educate Together Secondary Schools.